Always wanted to play and record keyboard parts without the tangle of annoying wires? Never will you have to feel this way with the LPK25 Wireless. Now you can control your plug-in instruments from anywhere in the room and not feel tied down to your desk. Powered by 3 AA batteries for a truly wireless experience, the LPK25 Wireless is optimized for long battery life which can make the LPK25 Wireless a go-to piece of gear even in a live stage setting. No batteries? No problem. The LPK25 Wireless can also be powered with the included USB cable even if your batteries die, giving you no excuse to call it a day and stop your creativity. At the center of the controller is a solid, 25-note mini-keybed that’s nice to the touch. Octave up and down buttons ensure you are playing in the right note range. The Arpeggiator mode turns chords into exciting and complex music phrases with ease. The LPK25 Wireless also comes equipped with a sustain pedal input for enhanced control over every chord, riff and run. The on-stage musician will get to love the LPK25 Wireless just as much as the studio producer since the LPK25 Wireless doesn’t require a MIDI cord, making it an especially lethal tool on stage. The LPK25 Wireless is ultra-portable and laptops are just… portable. 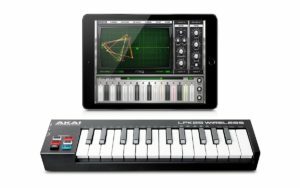 You can make your whole workstation ultra-portable with the LPK25 Wireless’s iOS compatibility. Feel free to produce on your iPad with your favorite beat making app, such as the iMPC Pro. Also, pairing your LPK25 Wireless with the LPD8 Wireless, our Bluetooth MIDI enabled pad controller, will put your creativity into overdrive, all while maintaining a truly mobile setup. The LPK25 Wireless is the pioneer of a new generation of MIDI controllers by keeping you connected to your production and live performances – no cables necessary. Want a mobile guitar rig for jamming and recording that fits in a small bag? Well if you’re comfortable with using an iPhone look no further. We are using an iPhone as the central brain for things like effects, amp modeling, and recording. 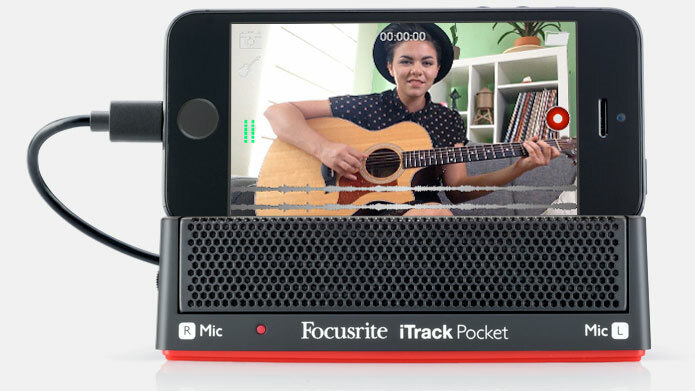 For the interface we will use a Focusrite iTrack Pocket. The iTrack Pocket features an instrument line in with preamp as well as two mics (left and right). I’m recommending the Anker SoundCore for amplifiction. The SoundCore is one of Amazon’s best sellers. It is a great portable speaker with long lasting rechargeable batter and bluetooth for connecting wirelessly. There are several speakers on the market so you could choose a different one if you like for example you might want a waterproof speaker. 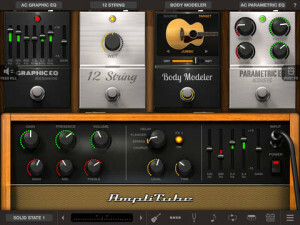 For effects and amps I chose Amplitube by IK Multimedia. Amplitube is jammed packed with features and it can be expanded when needed via in app purchases. 1) iPhone. The iPhone will be the central brain for processing and recording your guitar. 2) Audio Interface. In this case I recommend the Focusrite iTrack Pocket interface because not only does it have an instrument input it also has a couple mics. 3) Amplification. Bluetooth wireless rechargeable speakers. I recommend the Anker SoundCore. What You Get: Anker SoundCore Sport XL, Micro USB cable, hand strap, welcome guide, our worry-free 18-month warranty and friendly customer service. 4) Effects and amps. I recommend the iRig Amplitube app. Elastic Drums announced it will integrate Ableton Link sync into the app by end of November. 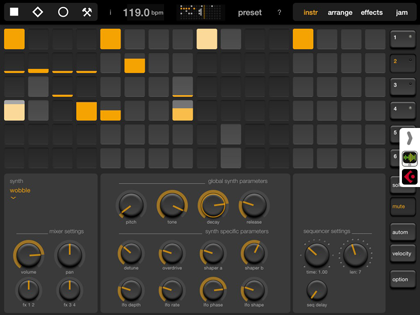 Link is a new technology developed by Ableton that lets you play in time with multiple iOS devices and multiple instances of Ableton Live music software over a wireless network. It’s not JUST MIDI over Wi-Fi so don’t worry it actually works and works well based on a new type of development that sends song position and tempo information and that’s all. 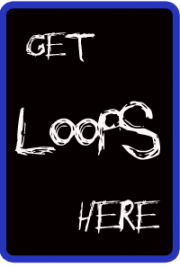 It contains six channels of high quality synthesized drum sounds, a step sequencer and 4 effect channels. All important control parameters are automatable. The result: Elastic drum composition!